mediAvatar iPod Transfer can not only rip and copy music, videos, photos, eooks and playlists from iPod to PC and PC to iPod, but also supports iPod to iTunes transfer. 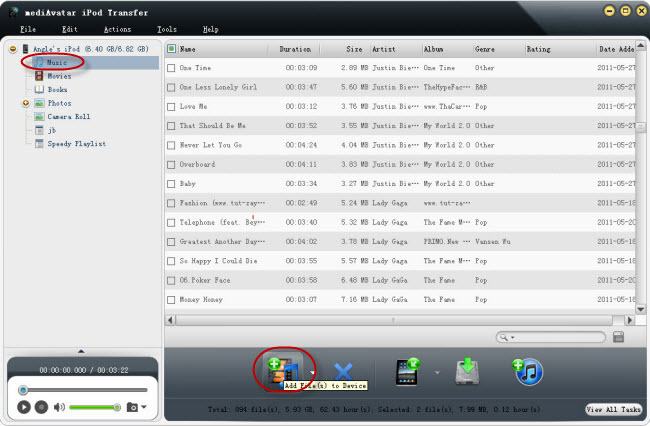 What's more, mediAvatar iPod Transfer makes it easy to share files between two apple devices (iPod, iPhone, or iPad). And here we divide the guides into four parts to introduce the functions. On the device info screen, click the "Add file(s) to Device" button, then choose the supported (movie, music, photo, or ebook) file(s) on the hard disk, then the file(s) would be added to the corresponding file node and sync to iPod. While, you can also open each node on the left node tree to transfer files to. Click to open each node, and you could check the file info in each directory. 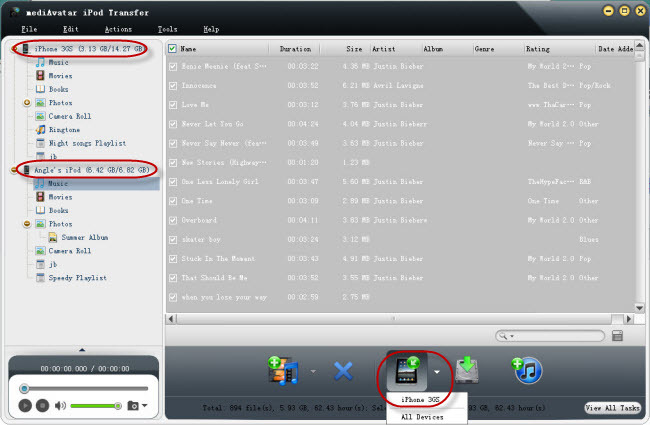 In "Music" node, click "Add to device" button, and choose the supported music files on computer to iPod. You can add AAC, MP3, WAV, AIFF, and M4A music files to iPod. In "Movie" node, click "Add to device" button, and choose the supported video files to iPod. 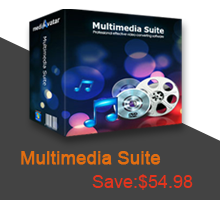 You can add M4V, MP4, MOV, MPEG-4, H.264 videos to iPod. In "Book" node, click "Add to device" button, and choose the supported PDF, EPUB ebook files and transfer to iPod. 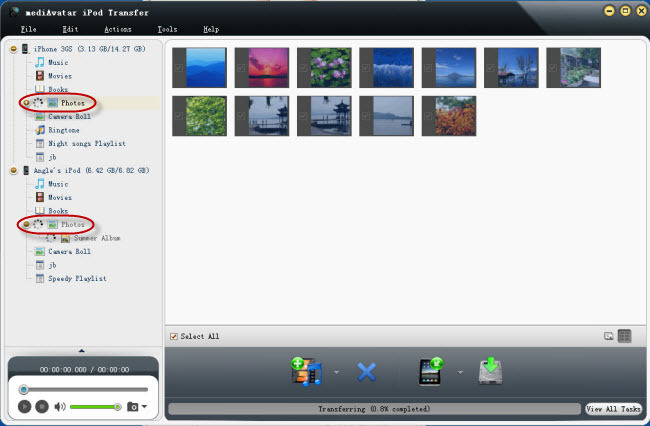 In "Photo" node, click "Add to device" button, and choose the pictures and transfer to iPod. 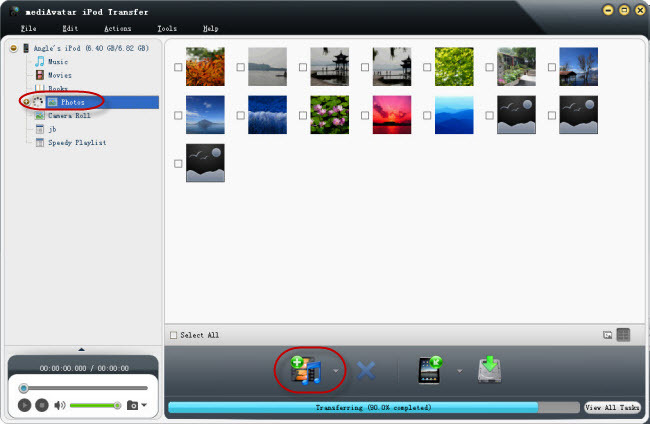 mediAvatar iPod Transfer enables you to copy iPod contents mentioned above as well as iPod camera Roll (iPod touch 4 only) to computer very easily. Here we take the iPod music as example. In the music node, choose all or several songs you want to copy, and click the "copy file(s) to computer" button and choose the destination folder to export iPod music to computer. And surely, the iPod movies, photos and ebooks could be transferred to PC in this way also. For iPod Touch 4 only: To transfer iPod shooted photos, open the "Camera Roll" node, choose the photos, and click the "copy file(s) to computer" button and choose the destination folder to copy iPod shooted photos to computer. As "Copy iPod files to computer" also, open each node, and choose the files, then click "copy file(s) to iTunes" button and set the destination folder, you will transfer those files to iTunes soon. To do this, connect another idevice (iPod also, or iPod, or iPad) to computer, and you will see both of the devices info would be displayed in the software left node tree. 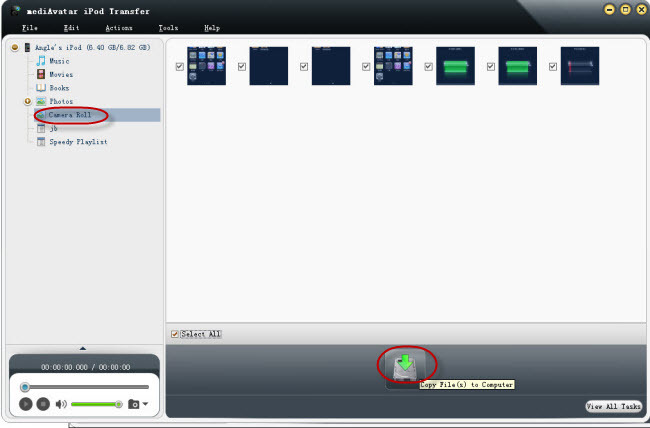 Then choose the file in one of the device and click "copy to other device" button and choose the listed device. Then the files would be transferred to another idevice. Picture below shows iPod music to iPhone 3GS transfer. And more than these, you can go to mediAvatar iPod Transfer product page for detailed info. In this guide we use "button" to achieve most of the operations, you can directly drag-drop files to accomplish all of these.